Mikheil Saakashvili in his presidential heyday, Tbilisi, 2008. (c) David Khizanishvili / RIA Novosti. All rights reserved.Last Friday, as Americans gathered at the National Mall to watch president Donald Trump’s inauguration speech, Mikheil Saakashvili, the former president of Georgia and maverick mayor of Odessa, gave a rousing speech of his own. Addressing the crowd of 7,000 delegates at the United National Movement’s (UNM) party convention in Tbilisi, Georgia by conference call from Washington D.C., Saakashvili spoke at length on Georgian “exceptionalism” and “the beginning of a new great era.” He berated the “pseudo-liberals” and “elite groups” just hours before Trump would disparage the “establishment” and lay out his “new vision” for “making America great again”. The speeches echoed each other; slogans for a new right-populist era. Since the primaries, Saakashvili, knowing which way the wind blows, started boasting of his “20 years of friendship” with the president. He decorated Trump with the Order of Excellence during his visit to Georgia in 2012. “New America was built by [Trump]” declared Saakashvili in 2012, during the meeting. “You’re a big man outside this area, believe me”, responded The Donald. Despite similarities in rhetoric, Saakashvili had less reason to be festive. After all, this wasn’t a celebration of his electoral breakthrough; UNM, Georgia’s ruling party in 2004-2012, won just 27% of the vote in the 2016 parliamentary elections, securing 27 mandates out of 150. Nor was this speech his confirmation as party chairman; after losing Georgian citizenship in late 2015, Saakashvili was deprived of the right to officially chair a political party in Georgia. Since then, he’s been UNM’s figurehead-in-absentia, while simultaneously building a new force in Ukraine’s parliamentary opposition. Instead, Saakashvili’s conference call came slightly over a week after several party heavyweights, including Davit Bakradze, Giga Bokeria and recently freed former Tbilisi mayor Gigi Ugulava, as well as the majority of UNM lawmakers quit the party. They announced the start of a new political movement under the name of the European Georgia, reducing UNM’s parliamentary representation to only six MPs. 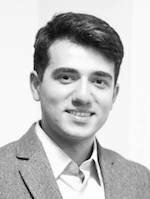 That was a near thing, too – had lawmaker Azer Suleymanov not decided to remain with the pro-Misha faction at the last moment, the UNM couldn’t have formed a parliamentary faction at all. This wasn’t the first time the UNM has lost members of parliament; almost 20 lawmakers left in 2012; more defected in 2015 and 2016. Despite its seeming insignificance, the UNM convention will inevitably affect the overall state of Georgian democracy. Not only did Saakashvili formalise his victory in the four-month-long tensions with UNM’s Tbilisi-based leadership, he also secured the allegiance of the party’s grassroots, and hence, a free hand to run party affairs with a less compromising pool of leaders, signaling the beginning of the party’s transformation to a more vocal, protest-oriented movement. 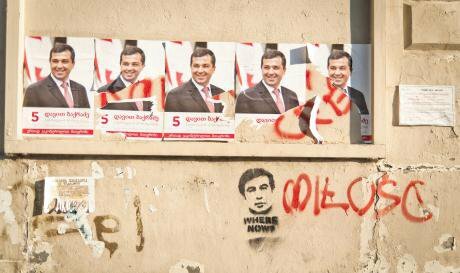 Despite some allegations of unlawful campaigning and several cases of violence, Georgia’s 2016 parliamentary contest was mostly peaceful, competitive and well-administered. Fundamental freedoms were generally observed; contestants were able to campaign freely and voters could choose from a wide range of competitors. Its consequences, however, are worrying. The hopes for a multi-party parliament have been effectively dashed. The incumbent Georgian Dream-Democratic Georgia garnered 49% of votes in the nationwide party-list contest and won the absolute majority of single-seat electoral districts, claiming a constitutional majority of 113 seats in the parliament (GDDG is represented by 115 MPs), a considerable step backwards from the diversity and balance of the previous configuration in parliament. The Alliance of Patriots, the Georgian replica of contemporary European right-wing populist parties, has cleared the five percent threshold and obtained six parliamentary mandates, leaving much older and more experienced liberal “third parties” far behind the electoral bar and prompting a fundamental reshuffle on the oppositional spectrum. Soon after the elections, Irakli Alasania, leader of the Free Democrats, announced that he would be "temporarily quitting” politics, followed by Davit Usupashvili, the leader of the Republican Party and the former Parliamentary Chairman, who announced that he would be parting ways with the Republicans and starting a new oppositional political force. Operatic bass turned politician Paata Burchuladze, whose State for the People party was considered as a possible third party challenger to the UNM-GDDG duo, won just three and a half percent of the vote, before also leaving politics. Troubles emerged in the UNM as well. While Saakashvili called for the results to be boycotted, the Tbilisi-based party leadership preferred to enter the parliament and the majoritarian runoffs. A populist victory for the UNM? UNM’s poor performance in the second round of elections has reignited internal party disputes. Disagreements have emerged on a range of issues, from filling the vacant seat of party chairperson to the date and the scale of the 2017 party convention. The underlying reason for the dispute was much deeper; the conflict between Saakashvili and the Tbilisi-based leaders (Davit Bakradze, Giga Bokeria and Gigi Ugulava) concerned the role of Mikheil Saakashvili in the party and its future strategy. 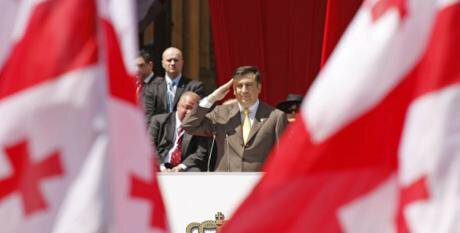 This conflict dates back to late 2013, when Saakashvili left the country for the United States and then for Ukraine, where he served as the governor of Odessa region from May 2015 to November 2016. Lacking a clear frontrunner, UNM’s Tbilisi-based leadership opted to delegate executive functions to collective party organs, gradually decreasing Saakashvili’s impact on UNM’s everyday decision-making. They also decided to employ a more modest, procedural means for fighting the ruling party, which Saakashvili strongly opposed. Electoral flyers for Davit Bakradze, the UNM’s candidate in 2013’s presidential elections. Saakashvili (in graffiti form) looks up from below. CC-by-NC-ND-2.0: Marco Fieber / Flickr. Some rights reserved. By contrast, Saakashvili favoured radical measures reminiscent of Kmara! (Enough), a UNM-affiliated youth group known for its frequent street rallies prior to the 2003 Rose Revolution. This was seen in his aggressive rhetoric before the parliamentary elections, his vows to return to Georgia after the elections, even though he is wanted on multiple charges, and his preference for boycotting the runoff polls. Despite disagreement, Saakashvili chose to avoid open confrontation with the Bakradze-Bokeria-Ugulava group before the parliamentary elections. The runoff polls presented him with an opportunity, and Saakashvili cleverly played on the resentment of UNM voters, accusing “the party bureaucracy” of failing to “defend the votes”. UNM’s decision on November 30 to conduct the convention with 7,000 delegates, as Saakashvili wanted, did not end the crisis. The sides continued trading accusations. The conflict was particularly felt in social networks, where Saakashvili-sympathisers challenged their numerically fewer opponents, accusing them of trying to distance the party from Mikheil Saakashvili and its grassroots. UNM’s split will inevitably have an impact on the overall state of Georgian democracy. With the absence of a resilient and integral parliamentary counterweight, the GD-DG government might be tempted to abuse its constitutional majority and leave Georgia’s nascent institutional democracy in a highly vulnerable state. Georgians are watching with interest after GD-DG announced constitutional reforms. Moreover, Mikheil Saakashvili’s victory in the UNM party dispute reflects how Georgia’s messianic, highly personalised political culture is strengthening. It seems that for many UNM activists and voters, Saakashvili remains the party’s uncontested leader, whose return to power is highly sought. Saakashvili’s post-election rhetoric is worrying as well; it signals the UNM’s possible transformation into a radical, protest-oriented movement, the leader of which, is ready to extract electoral gains through a populist agenda. With the exception of Nika Melia, there are few political heavyweights among the pro-Saakashvili parliamentarians. Saakashvili is the only name likely to draw a crowd. Indeed, that may be the idea. The two groups has already incurred the electoral cost of their division. In the National Democratic Institute’s latest opinion poll, fielded in November and released in January, at the height of the dispute, only ten percent (down from 15% in June) named UNM as “the party closest” to them, compared to GD-DG’s 40% (up from 19% in June). This will come back to bite European Georgia, whose constituency has never been as stable as that of Mikheil Saakashvili. Saakashvili’s image as a politician who “gets things done” draws strong loyalty in traditional UNM strongholds in the regions of Georgia. That Saakashvili-sympathisers dominated the party’s regional leaders and grassroots activists, while his critics mostly comprised the Tbilisi-based leadership, speaks to a possible rural-urban divide between UNM and European Georgia supporters. 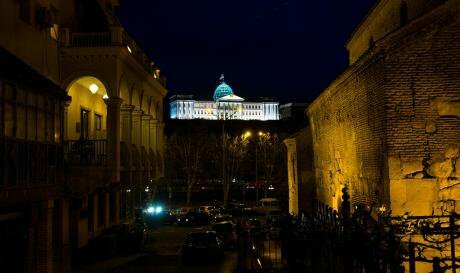 Georgia’s presidential palace by night, as seen from Old Tbilisi. CC-by-SA-2.0: Jagermesh / Flickr. Some rights reserved. Not only has the split reduced and fragmented the pool of stable UNM supporters, it has also pushed away the potential voters. The defeat of liberal third parties in Georgia’s parliamentary elections should have opened up the space for widening the party’s electoral base, but the dispute produced the opposite; GD-DG support has consolidated, while UNM’s dwindled. Whether European Georgia can establish itself as a credible political party remains to be seen. The group has a good starting position as it holds the status of parliamentary minority and commands two parliamentary factions, as well as several leading party officials. It also embraces political newcomers, a much-needed break from the negative associations that have haunted UNM for the last few electoral cycles. They are also outspoken on the negative legacies of Saakashvili’s time in office, giving them a shot at winning the non-UNM oppositional vote. But despite their tactical and rhetorical differences, and their different appraisals of Saakashvili’s rule, the two groups stand on a broadly similar ideological platform. On the economy, both favour small government and lower taxes. On social issues, both are moderately liberal. On foreign policy, both are pro-EU and NATO membership and hawkish on Russia. European Georgia has filed for observer status of the European People’s Party, just like the UNM. As European Georgia and what remains of the UNM redefine their new images, they will have to distance from each other meaningfully (more so the Ugulava-Bokeria-Bakradze group) as they get closer to the Municipal Elections in October, 2017. And all the while, Georgian politics remains caught in its cycle of saviours, and of schisms. Over 25 years have passed since the collapse of the Soviet Union. Find out more about where Georgia and its neighbours could be headed in Georgi Derluguian’s essay on the state of the south Caucasus.